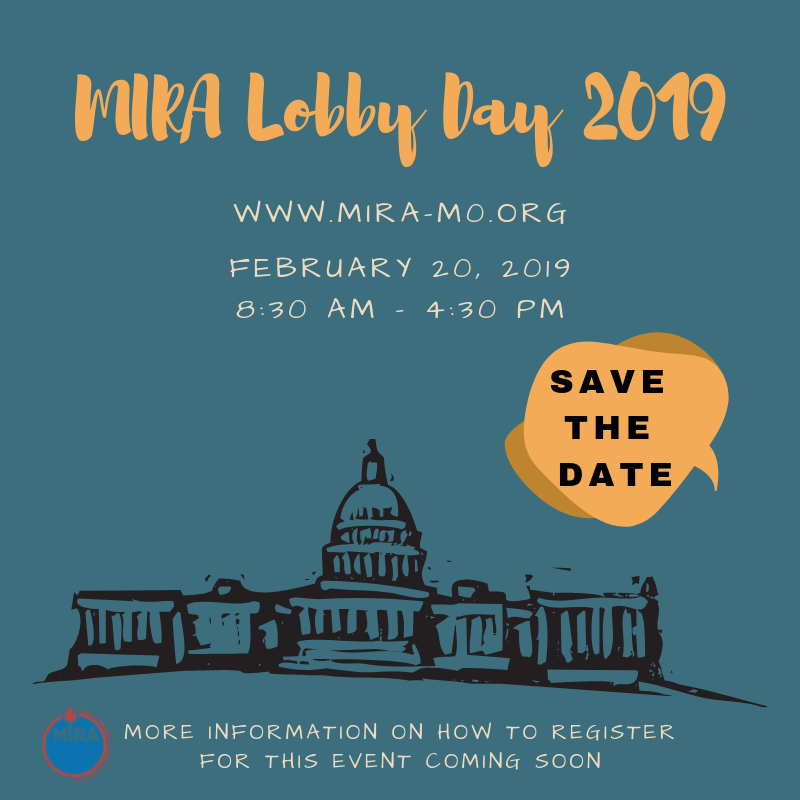 Join MIRA for our 2019 lobby day, where hundreds of Missourians will travel to the State Capitol in Jefferson City. This is a time to be emboldened to advocate for the rights of immigrants & refugees. We need your help to counter the growing trend of hatred in our nation. MIRA's lobby day is a day when you can do just that by having one-on-one meetings with elected officials, and becoming civically engaged. How do I Register? : Registration will be available on the MIRA website, if you are reading this you are in the right place. You can register until February 15th. If you decide to come after February 15th we will still welcome you, but will be unable to provide transportation. What are the Details Regarding Transportation? : We will have 15-passenger vans leaving from St. Louis, Missouri. The vans will leave St. Louis at 7:00 a.m., please meet at MIRA (2725 Clifton Ave.) the morning of February 20th. We plan to leave Jefferson City by 2:30 p.m. to return to St. Louis. We are also working to have a van leave from Kansas City. More details to come. If I'm Driving Myself do I Need to Register? : Yes, you must register in order to participate in lobby day. By registering our office is able to contact elected officials to arrange meetings, and we have a head count for lunch. If I'm Driving Where do I Park? : There is ample parking near the State Capitol Building on the street, in parking lots, etc. However parking is not free. Please be advised. Why do you Need my Address? : During the registration process you will be asked for your address. We use this information to arrange meetings between lobby day participants and State Representatives. Is Lunch Provided? : Yes it is! However, feel free to bring snacks. What Will I Talk to My Elected Official About? : We will provide all participants with talking points and issues to discuss during your meetings. We also encourage you to build a meaningful relationship through personal stories. Will There be Training Provided? : We will provide two types of trainings to prepare you for lobby day. One will be an online training available through our website www.mira-mo.org. The other will be in-person training available the day of February 20th. This training will be provided when we first arrive (at 8:30 a.m.) in Jefferson City. We will meet in the 3rd floor rotunda - House side. If I Have More Questions? : Email info@mira-mo.org.